Thiruvananthapuram, Sept 10: The Kerala Railway Police and Railway Protection Force (RPF) will formally take up the matter of COTPA compliance in railway stations with the divisional railway authorities. 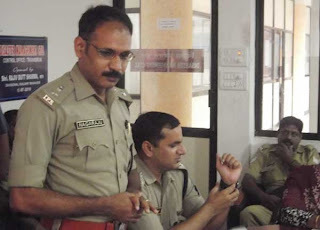 Railway Superintendent of Police Ch.Nagaraju and Divisional Security Commissioner, RPF Rajnish Kumar Tripathi jointly took this decision after a sensitisation session on the Indian tobacco control law, COTPA, 2003. The hour-long sensitisation programme, facilitated by Tobacco Free Kerala – a coalition of like-minded organisations chaired by Hon’ble Kerala Health Minister VS Sivakumar and driven by Regional Cancer Centre here – not just exposed implementing officials to the various sections of COTPA but also drove home the manifold hardships caused due to tobacco use. Retd. DySP Adv K Mohana Kumar who handled the session began by explaining the physical harms caused from tobacco use. The nicotine residue from a popular brand of cigarette is potent enough to kill upto seven people when injected into the blood stream. Users of chewing tobacco products such as pan masala and gutkha, over time, lose sense of touch and taste, besides acquiring a high risk of developing painful oral cancers, he explained. The next part of the presentation featured explanations on the various COTPA sections and the punitive measures prescribed for violation of each. Section 4 of COTPA prohibits smoking in all public places; acts of violation will invite a fine up to Rs 200. Public places have also to put up mandatory signages stating “No Smoking Area – Smoking Here is an Offence”. Such boards of no less than 60 cm by 30 cm should be put up at the entrance of the public place and at conspicuous places inside. Public conveyances, railway stations, railway waiting rooms, refreshment rooms and the like have been included under the list of public places under Section 4. Section 5 prohibits all forms of tobacco advertisements; Section 6 prohibits sale of tobacco products to and by minors – sale of tobacco products within a 100-yard (91.4 metres) radius of an educational institution is prohibited. Section 7 requires statutory health warnings in all tobacco products’ packages. Under COTPA, police officers not below the rank of Sub-Inspector of Police are authorised to take action against violations on its various sections. Moreover, railway authorities includingStation Master, Assistant Station Master, Station Head, Station-in-charge, Travelling Ticket Examiner, Chief Ticket Inspectors, Ticket Collector and officers not below the rank of Asst Sub-Inspector of RPF are empowered for implementing Section 4 of COTPA, the participants were told. Video documentaries of tobacco victims made by RCC recounting their experiences and making an emotional appeal to give up all forms of tobacco use were also aired during the session. One video featured a young man whose tongue had to be partly removed following oral cancer; even with the best of treatment he had to face a premature death. 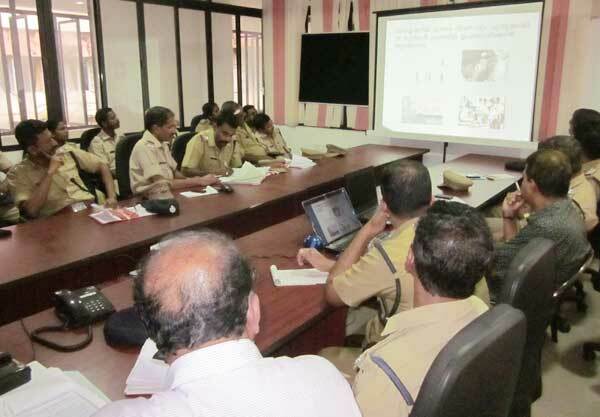 As many as 30 implementing officials of Kerala Railway Police and Railway Protection Force participated in the session, in which Rajnish and S Sanal Kumar, DySP Administration, Kerala Railway Police also spoke.